101 Squadron Memorial Ludford Magna, Lincolnshire. On the 16th July 1978 a memorial to 101 Squadron, paid for by funds raised from veterans, was unveiled at Ludford Magna by AVM Robert “Bob” Blucke DSO AFC, who had commanded Ludford Magna from 1943-45 and earned his DSO flying a 101 Sqn Lancaster on a raid against Mannheim in September 1943. Over 300 attended and afterwards, at a tea provided by the Ludford WI. This event marks the genesis of the 101 Squadron Association and since then, annually on the first Saturday of September wreaths are laid at the Memorial in remembrance of those who gave their lives in service with 101 Sqn. In 2012, to mark the 95th anniversary of 101 Squadron, plaques were added to the Memorial detailing the Battle Honours earned by 101 Squadron since its formation in 1917. Memorials to 101 Squadron in Ludford include a “Roll of Honour” displayed in the village church with over 1000 names of 101 Sqn aircrew killed in action during WWII. Also in the church can be found the first 101 Squadron Standard, laid up in 1988. On the wall of the White Hart pub is a bronze plaque dedicated in 2007 to the 740 101 Sqn aircrew and ground crew who were killed while serving at Ludford Magna between June 1943 and May 1945. 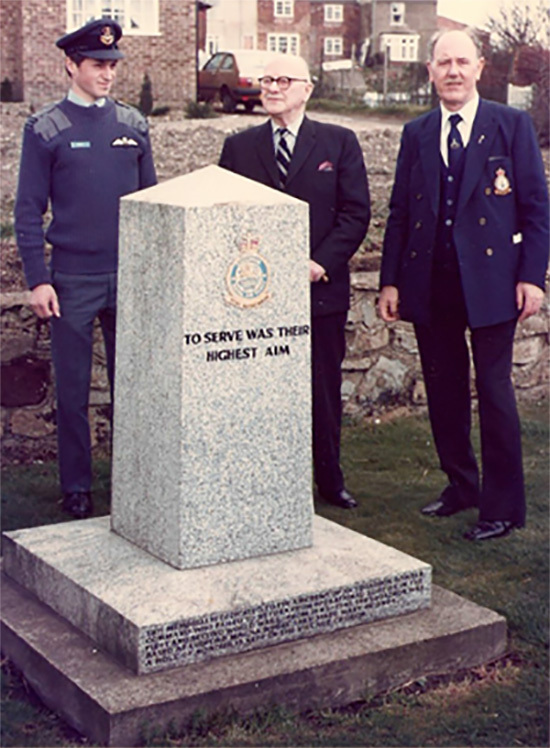 Flt Lt Andy Bray, AVM "Bob" Blucke DSO AFC and Association secretary Jack Morley at the Ludford Magna 101 Sqn Memorial in 1984. 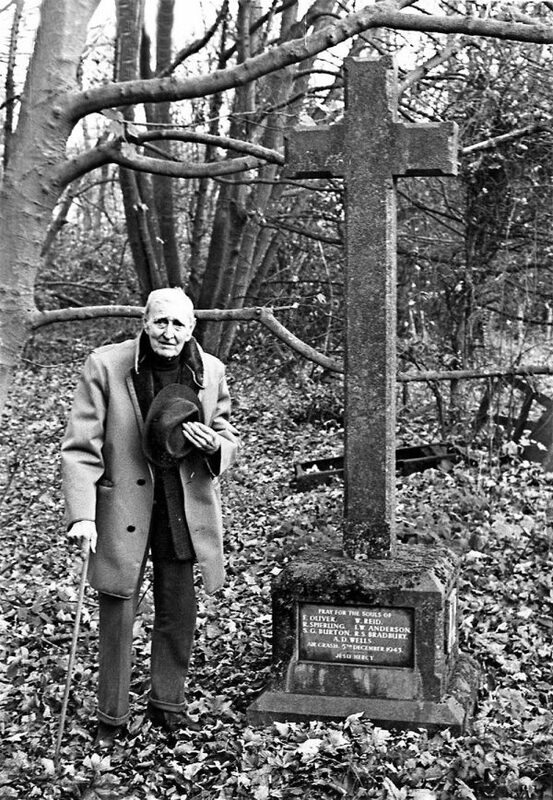 Mr Sidney Smith at the Scallows Wood Memorial in 1984. Scallows Hall Wood Memorial Cross, Nr Binbrook, Lincolnshire. On the 5th Dec 1943 101 Sqn Lancaster DV270 coded SR-E took off from Ludford Magna at 16.58 hrs on a training flight with Flg Off Francis Oliver and his crew. Three and a half hours later at 20.28hrs it emerged from low cloud, hit treetops at Binbrook Hall and, just missing Scallows Hall, crashed in Scallows Wood. Sidney Smith, a farm foreman working nearby, rushed to the blazing Lancaster and tried to drag the pilot from the cockpit. Sadly, despite his efforts, all seven crew perished. Their names were inscribed on a memorial cross erected by the local squire, William Wright, in their memory and in gratitude at their efforts to miss the hall with his daughter in it. RAF Welford Memorial Stone, Berkshire. 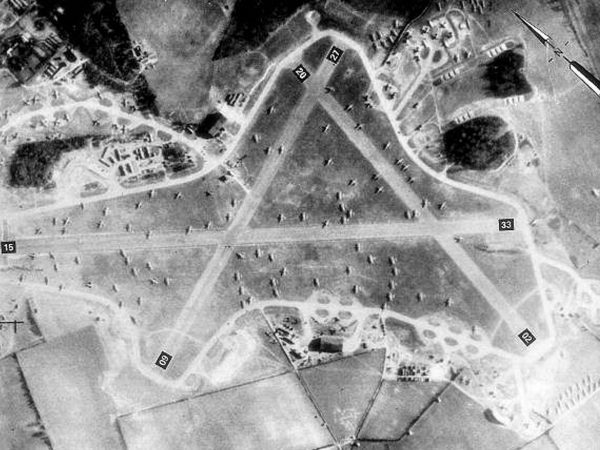 At 0503 on the 31st March 1944 an explosion awoke RAF Welford, the base near Newbury in Berkshire of the US Army Air Corps 435th Troop Carrier Group, and its four C-47 “Skytrain” squadrons. At first an air raid was suspected but soon it became clear that a crashing aircraft had caused the blast. This was 101 Sqn Lancaster DV290, coded SR-X and flown by FS Edwin Thomas and his mixed Australian, British and Canadian crew on their 5th operation. All eight aircrew were killed. SR-X was the last of seven 101 Squadron Lancasters lost that night with 47 of their aircrew killed. It was the infamous Nuremberg raid, a dreadful night in which Bomber Command suffered its highest losses of the war. Thomas’ Lancaster had hit the ground in a 30-degree dive from an overcast sky and initially it was rumoured that they were attempting a landing at Welford. However, the evidence fails to support this theory and in fact SR-X was not far from its planned course for Ludford Magna. Maybe the SR-X was damaged by a night fighter or flak and Thomas and his crew elected to try for home, succumbing with only 120 miles to go. Sadly, we will never know exactly what happened to the bomber and its crew during their mission as the crash destroyed all evidence that could have assisted the brief wartime investigation. The terse, 3-line accident report merely concludes that nobody was to blame. However, it is likely that they were a combat loss and that damage from enemy action led to the eventual crash at Welford. They were the 101st British bomber lost that night. 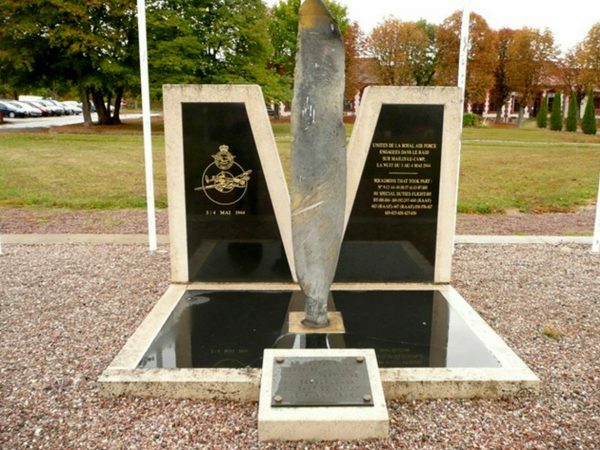 In March 1996 members of the Ridgeway Military Aviation Reseach Group constructed a memorial to the crew at RAF Welford, now a USAF weapons storage facility, and annually on the anniversary of the Nuremberg Raid a joint US/UK wreath laying ceremony takes place to remember the multinational 101 Sqn crew of SR-X. At 2150 on the 30th March 1944, 101 Sqn Lancaster LL861 SR-U flown by Australian Plt Off Donald Irving and his mostly Australian crew took off from Ludford Magna with 26 others bombers on the way to Nuremberg. By 0045 they had been blown well off course by strong winds and fell prey to a German Me110 night fighter flown by Huptman Gustav Tham. The Lancaster exploded with great force, scattering debris over a larcge area near the German town of Lauterbach and killing all eight of the crew, who were on their 9th operation. 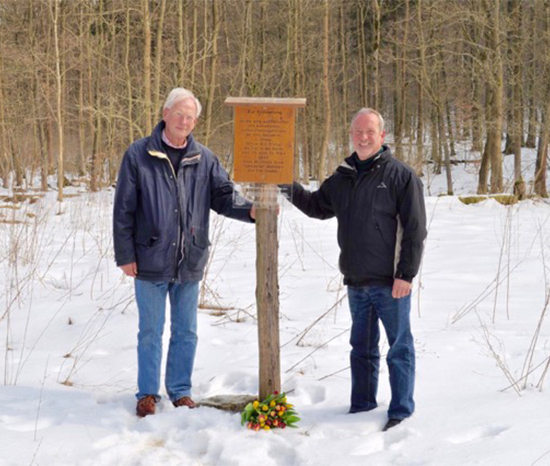 As a result of research in 2008 by local Dutchman Mr Jan Schipper, (a current Member of the Association), people erected a simple memorial to the crew in the presence of the nephew of the pilot Donald Irving, Mr Robin Riley, and since then they have paid their respects on the anniversary of the crash at the site in woodland near Lauterbach. RAF Provincial Memorial “Heidekruisje”, Boxbergheide near Genk, Limberg, Belgium. The people of Boxbergheide call it the “Heidekruisje” or the Cross in the Heather, and on the second Tuesday in September they gather with their children to lay flowers on a memorial that had its origins in the crash of a 101 Sqn Wellington on the 1st August 1941. 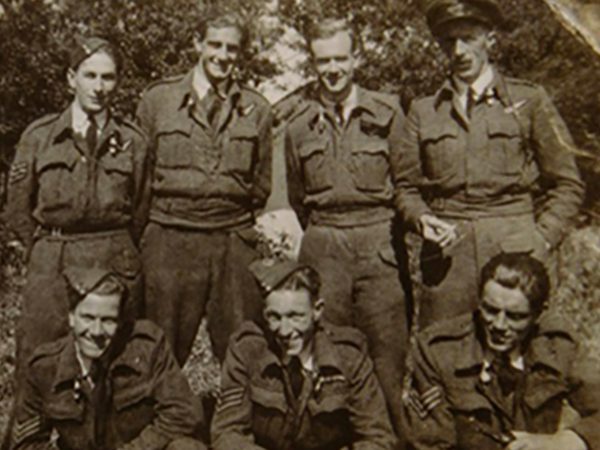 Three aircrew were able to bale out and with the assistance of the Belgium resistance two of them managed to evade capture and return to England. Sadly the Wellington’s pilot, 22 year old Plt Off Fredrick Ashton, navigator Sgt Ernest lane and wireless operator Sgt John Redden were killed and buried by the Germans near the crash site on a barren heather heath called Boxbergheide. Soon local people tended the graves and decorated them with white stones and flowers. Unfortunately they were regularly desecrated by Hitler Jungend from another village but the children of Boxbergheide restored them. A wooden cross, made by local Polish workers, appeared on the site but was frequently torn down by the Nazis. Then in 1943 a concrete cross, made in secret at the nearby Winterslag coal mine, was firmly emplaced and the legend of the Heidekruisje was born. Annual ceremonies at the Cross in the Heather began in 1948 and in 1968 money was raised for a more substantial memorial. The first major commemoration involving RAF personnel took place in October 1969 and work began on the new memorial in 1970. It was built with help of local volunteers on the heather heath and it was inaugurated on the 27th September 1970. 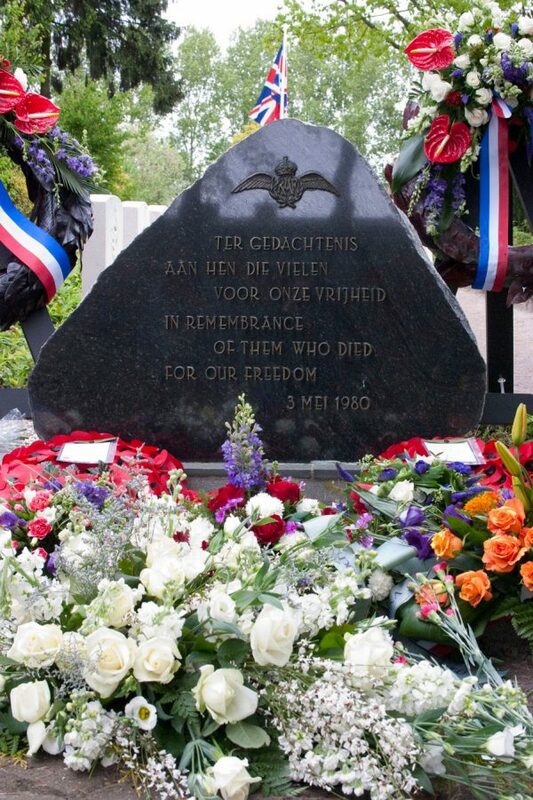 The sober memorial wall is dedicated to all 139 RAF aircrew who lost their lives in the province of Limberg during the war, but still bears the names of the three 101 Sqn aircrew whose graves became a focus of local resistance at the Heidekruisje. 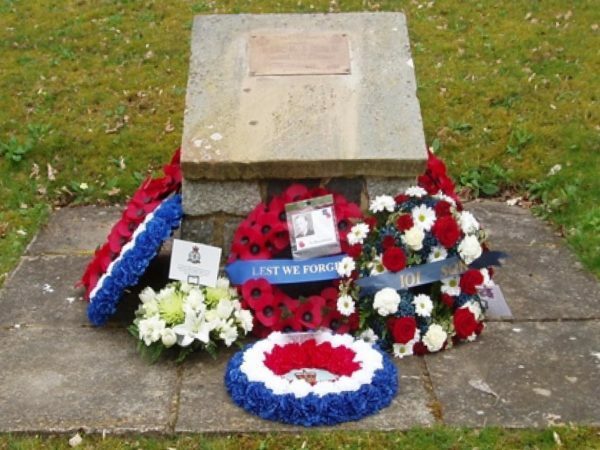 For many years 101 Sqn has attended the annual ceremony, held on the second Tuesday of September, and led the parade to the memorial where local politicians, military officers and veterans lay wreaths before hundreds of school children lay floral tributes of their own, perpetuating the legend of the cross in the heather. The 30th June 1944 was a busy day for 101 Sqn. 16 Lancaster crews took part in a successful daylight raid on Villers-Bocage in Normandy and that night a further 10 bombers took off from Ludford Magna to participate in a raid by 118 No 1 Gp Lancasters on railway yards at Vierzon north east of Bourges. The raid was a success with accurate bombing thanks to the 1 Gp marking flight, however 14 Lancasters were lost, three of which were from 101 Sqn. One of these was LL863 SR-M flown by Plt Off Harry Taylor and his crew who took off from Ludford at 22:25 on the 30th June. In the early hours of 1st July they were shot down about five miles south west of their target near the village of Massay. The Lancaster exploded killing all but the pilot who miraculously escaped. Taylor was actually jewish and had changed his name from Doniger to serve in the RAF. If captured his fate in the hands of the Nazis would have been bleak. Fortunately he managed to hide from the German forces and was aided by the local resistance to escape back to allied lines. 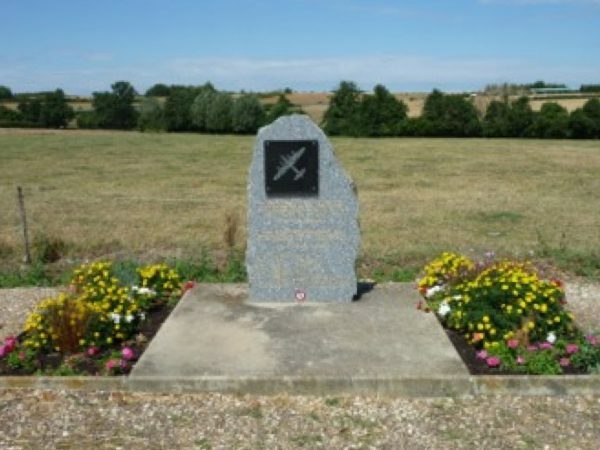 On Saturday 5th March 1995 a memorial commemorating the crew of Lancaster LL863 was unveiled a few meters away from the crash site on the D2020 road south of Massay. Over 600 people attended the ceremony including Harry Taylor, now called Doniger again, and his family. A party form 101 Sqn, led by Wg Cdr Peter Ollis OC 101 Sqn, had flown a VC10 into the nearby French Air Force base at Avord to participate in the event and during the weekend paid tribute to all 23 aircrew from the three 101 Sqn Lancasters lost on the raid by visiting each of their war grave sites and laying wreaths. During WWII Mailly-le-Camp, located about 40 miles south of Reims, was a training base and depot for Germany tanks housing units of the 21st Panzer Division. As such it was a prime target for Bomber Command in preparation for D-Day. On the night of the 3rd and 4th May 1944 it was attacked by a force of 346 Lancasters from 1 and 5 Group, including 21 from 101 Squadron. Although the attack was ultimately successful, a break down in communications led to confusion and delay among the attacking force leaving most of it orbiting the “IP” north of the target for a critical period where, in bright moonlit conditions, they fell prey to Luftwaffe night fighters. 42 Lancasters were lost, most falling in the French countryside around Mailly with 5 bombers crashing on the village of Poivres, just 2.5 miles from the target. 101 Squadron lost 37 of its aircrew killed in action that night with only 2 survivors from 5 Lancasters shot down. Many veterans consider the Mailly raid to have been the most traumatic “chop night” of the war as so many bombers were seen falling ablaze in such a relatively small area. 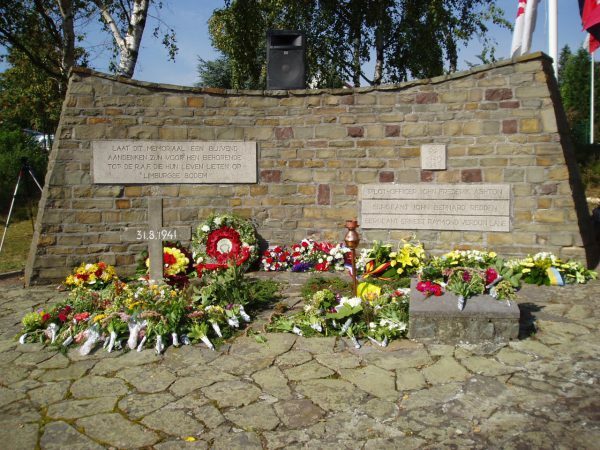 In May 1991 a splendid memorial to all the aircrew killed in the Mailly raid was inaugurated at the French Army base and since then members of the Association and of 101 Squadron have attended the annual parades commemorating their sacrifice. Of the 24 Commonwealth War Graves in the cemetery at Nieuw Dordrecht, Drenthe, in the Netherlands, 8 are the crew of 101 Sqn Lancaster DV287, SR-N. At around 1645 on 14th January 1944 21 Lancasters took off from Ludford Magna to join a 498 bomber force attacking Brunswick. Unfortunately the Luftwaffe tracked the force when it was still only 40 miles from the Lincolnshire coast and fell among the bomber stream with deadly effect downing 38 Lancasters, three of which were from 101 Sqn. SR-N was flown by Plt Off Joe Slater and his crew, which that night included a “second dickie” pilot FS Maxwell Patterson, making 9 crew on board their Lancaster. Around 1840 they were engaged by Luftwaffe nightfighter at 19,500 ft which used the deadly 20mm “Schrage Muzik” upward firing cannon to deadly effect, setting ablaze the Lancaster’s port wing and fuselage. SR-N was seen to descend and explode just above the ground near the Dutch border village of Klazienaveen. The only survivor from SR-N was the navigator Flg Off Alex Walmsley, who managed to evade capture thanks to the Dutch resistance and escape back to England. All 24 of the other aircrew in the three Lancasters 101 Sqn lost that night were killed. 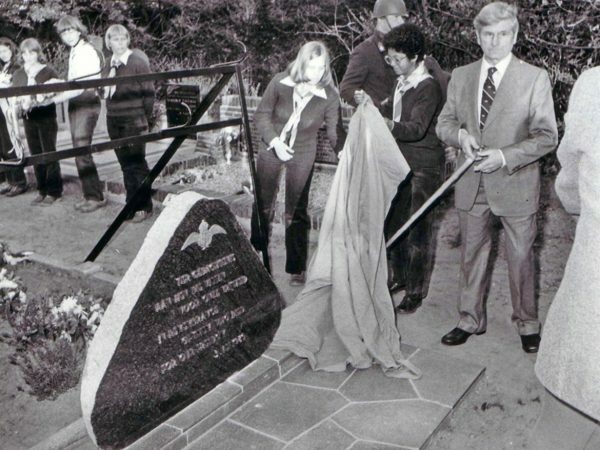 On the 3rd May 1980 a new memorial Stone was unveiled in the Nieuw Dordrecht Commonwealth War Grave Site and links established between the Dutch committee and the 101 Sqn Association. Every 4th May a memorial ceremony is held at the site.